A joint China-Austria team has performed quantum key distribution between the quantum-science satellite Micius and multiple ground stations located in Xinglong (near Beijing), Nanshan (near Urumqi), and Graz (near Vienna). Such experiments demonstrate the secure satellite-to-ground exchange of cryptographic keys during the passage of the satellite Micius over a ground station. Using Micius as a trusted relay, a secret key was created between China and Europe at locations separated up to 7,600 km on the Earth. Private and secure communications are fundamental for Internet use and e-commerce, and it is important to establish a secure network with global protection of data. Traditional public key cryptography usually relies on the computational intractability of certain mathematical functions. In contrast, quantum key distribution (QKD) uses individual light quanta (single photons) in quantum superposition states to guarantee unconditional security between distant parties. Previously, the quantum communication distance has been limited to a few hundred kilometers due to optical channel losses of fibers or terrestrial free space. A promising solution to this problem exploits satellite and space-based links, which can conveniently connect two remote points on the Earth with greatly reduced channel loss, as most of the photons' propagation path is through empty space with negligible loss and decoherence. 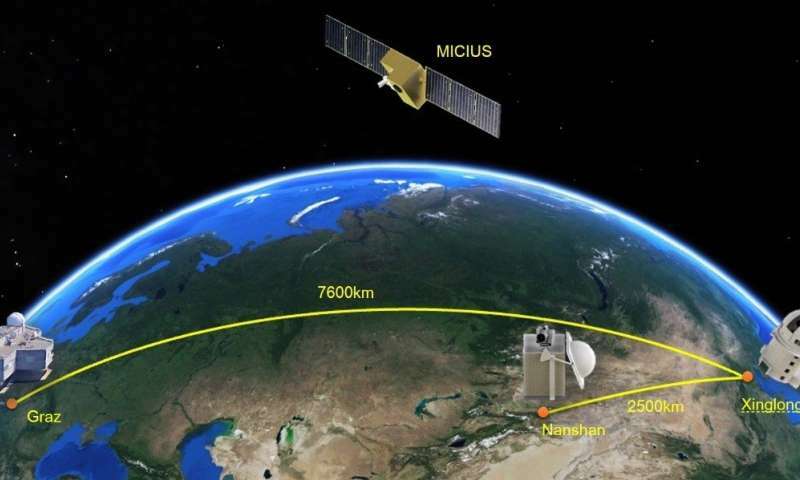 A cross-disciplinary multi-institutional team of scientists from the Chinese Academy of Sciences, led by Professor Jian-Wei Pan, has spent more than 10 years developing a sophisticated satellite, Micius, dedicated to quantum science experiments, which was launched on August 2016 and orbits at an altitude of ~500 km. Five ground stations in China coordinate with the Micius satellite. These are located in Xinglong (near Beijing), Nanshan (near Urumqi), Delingha (37°22'44.43''N, 97°43'37.01"E), Lijiang (26°41'38.15''N, 100°1'45.55''E), and Ngari in Tibet (32°19'30.07''N, 80°1'34.18''E). Within a year after launch, three key milestones for a global-scale quantum internet were achieved: satellite-to-ground decoy-state QKD with kHz rate over a distance of ~1200 km (Liao et al. 2017, Nature 549, 43); satellite-based entanglement distribution to two locations on the Earth separated by ~1200 km and Bell test (Yin et al. 2017, Science 356, 1140), and ground-to-satellite quantum teleportation (Ren et al. 2017, Nature 549, 70). The effective link efficiencies in the satellite-based QKD were measured to be ~20 orders of magnitude larger than direct transmission through optical fibers at the same length of 1200 km. The three experiments are the first steps toward a global space-based quantum internet. 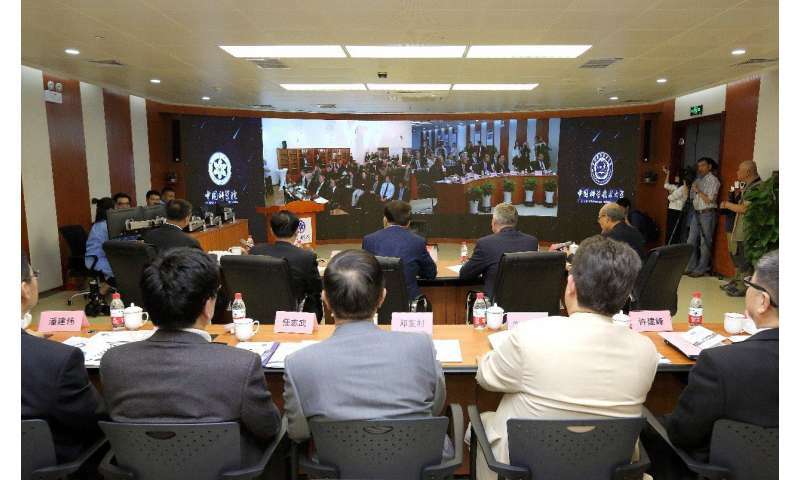 An intercontinental videoconference was also held between the Chinese Academy of Sciences and the Austria Academy of Sciences, employing the Advanced Encryption Standard (AES)-128 protocol that refreshed the 128-bit seed keys every second. 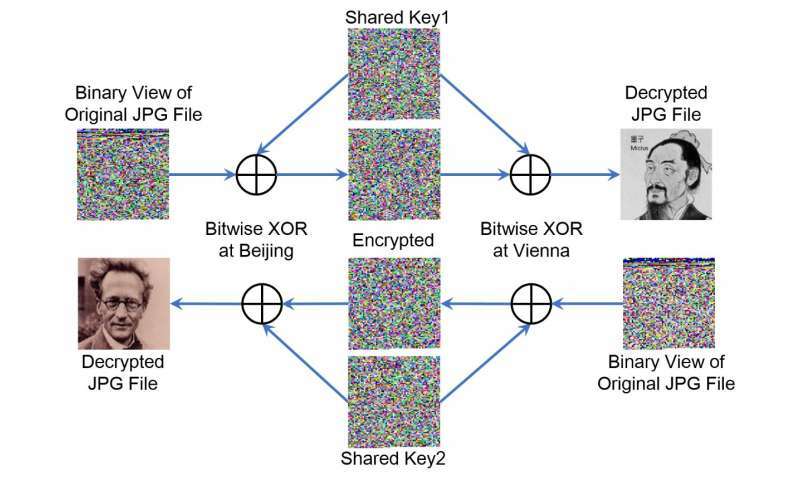 The videoconference lasted for 75 min with a total data transmission of ~2 GB, which included ?560 kbit of the quantum key exchanged between Austria and China. The study will be published in Physical Review Letters. If someone heard the words "quantum communications" and expected quantum entangled photons communicating instantly over light hours, they will be sorely disappointed reading this article.